SOUTH WILLIAMSPORT, Pa. (March 19, 2019) – Two iconic coaches from the 2018 Little League® World Series were recently recognized for their dedication to youth sports as winners of the 2019 National Double-Goal Coach® Award by the Positive Coaching Alliance (PCA). 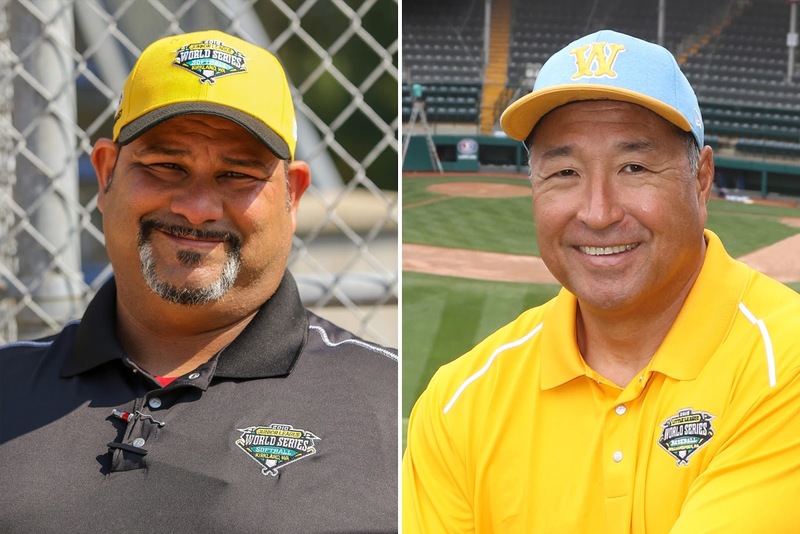 Gerald Oda, manager of the 2018 Little League Baseball World Series Champion Honolulu (Hawaii) Little League team, and Antonio Roman, coach for the 2018 Junior League Softball World Series Keystone/West Tampa/Bayshore (Fla.) Little League team, were selected as two of 50 recipients among a pool of nearly 1,000 nominees to earn the prestigious honor. As any sports parent and many youth athletes will tell you, it's not easy to find a great coach. That's part of the reason the Positive Coaching Alliance exists, to help develop great youth sports coaches. Annually, through inspiration, PCA finds coaches who are already great, and honors them with PCA's Double-Goal Coach Award, while holding those coaches up as examples for more coaches to emulate. Mr. Oda not only led his team to the Little League Baseball World Series championship, but helped inspire many through his leadership and respect both on and off the field. Despite the potential devastation the team was facing back home with an impending hurricane, Mr. Oda was able to keep his team focused on their experience in Williamsport and allowed them to serve as an inspiration to the entire community back home. Leading by example, Mr. Oda’s entire Honolulu Little League team became widely recognized as one of the most respectful and honorable teams in the entire event, and because of their actions were named co-recipients of the 2019 Jack Losch Little League Baseball World Series Team Sportsmanship Award. Along with his service as a coach for West Tampa Little League, Mr. Roman also serves as the Vice President of Softball on his local league’s Board of Directors, sharing his passion for Little League Softball® throughout West Tampa. This year, Mr. Roman led the Keystone/West Tampa/Bayshore Little League tournament team to a 4-2 record at the Junior League Baseball World Series in Kirkland, Wash., after sweeping the Southeast Regional tournament with a 3-0 record. Most importantly, throughout the entire year, Mr. Roman provided all his softball players with an opportunity to create lifelong memories, everlasting friendships, and a continued love for the game of softball through his coaching. As recipients of the PCA Double-Goal Coach Award, Mr. Oda and Mr. Roman will each receive a $200 check, a certificate from PCA, recognition on PCA's website, newsletters, and media campaigns, and an invitation to PCA's National Youth Sports Awards & Benefiton April 27 at Santa Clara University's Leavey Center in California. Little League International is proud to work with Positive Coaching Alliance to provide important on-field and off-field educational content. Learn more at LittleLeague.org/PCA. Founded in 1939, Little League® Baseball and Softball is the world’s largest organized youth sports program, with nearly 2.4 million players and one million adult volunteers in every U.S. state and more than 80 other countries. During its nearly 80 years of existence, Little League has seen more than 40 million honored graduates, including public officials, professional athletes, award-winning artists, and a variety of other influential members of society. Each year, millions of people follow the hard work, dedication, and sportsmanship that Little Leaguers® display at our seven baseball and softball World Series events, the premier tournaments in youth sports. For more information, visit LittleLeague.org, and follow Little League on Facebook (facebook.com/LittleLeague), Twitter (twitter.com/LittleLeague), and Instagram (Instagram.com/LittleLeague). Editorial: Is it really true that the Little League World Series is moving to Los Angeles? This website is neither affiliated, connected, or associated with Little League Baseball, Incorporated nor authorized, endorsed, sponsored, approved, or licensed by Little League Baseball, Incorporated. “Little League” and “Little League Baseball” are the registered trademarks and service marks exclusively of Little League Baseball, Incorporated. A Service of Williamsport OnLine - Copyright 2018. Awesome Inc. theme. Powered by Blogger.